Home » Magazine » National » Shoot Madi! Is The Bangalore Police Getting Trigger Happy? Ajay Sukumaran	January 10, 2019 00:00 IST Shoot Madi! Is The Bangalore Police Getting Trigger Happy? It’s well past midnight on a Friday but the outer ring road cutting through Bangalore’s tech corridor still has a steady flow of traffic. IT workers returning home after wrapping up their assignments for the weekend; friends heading back after a night of pubbing; Ubers and Olas taking passengers to and from the airport. Large glass-fronted buildings—many of them fully lit up at that late hour—line this stretch. At a police station next to a tech park, a young, quarrelling couple is registering a complaint, with an elderly parent in tow. Nearby, some decoy cops are out on the road, posing as late-shift techies and hoping to trap muggers, especially those offering lifts in cabs. For the cops in this area, this is part of the daily drill. Around eight decoy teams are deployed most nights. The 17-kilometre outer ring road arc passing through his division, says deputy commissioner of police Abdul Ahad, “has the largest concentration of IT companies in the world”. The stats are quite staggering—the area churns out a third of the city’s IT revenue. Ahad’s police division, Whitefield, was created only two years ago precisely for the same reason. To handle the new challenges posed by a rapidly urbanising neighbourhood of around 25 lakh residents, nearly a quarter of the city’s population. It’s a mix of many worlds, really. Beyond the giant mall and apartment complexes are the old villages. Amidst the glitzy, gated dwellings is a sprawl teeming with hostels and large settlements of migrant labourers. “The demography of this area has changed,” says Ahad. Naturally, the local crime graphs reflect the dramatic transformation—mobile phone-snatching, for instance, or thefts from paying guest hostels. Mugging was a problem a few months ago and the victims were mostly weekend travellers getting off buses early Monday and getting onto cabs that stopped by, until the police intervened by deploying additional ­patrolling teams and getting people to use app-based taxis. Effective policing measures, you could say. For the hardened criminals, however, there’s ano­ther approach that’s becoming increasingly apparent. Sample this statistic from Bangalore: in 2018, the police shot at miscreants on more than 30 occasions while making an arrest, a figure that’s unusual by the city’s annual average of police shooting incidents. None of them were fatal, unlike in Uttar Pradesh, for instance, where the spiralling number of encounter deaths this past year has raised the alarm of gross human rights violations. The Bangalore cops were aiming at the legs of alleged law-breakers but the message it conveyed is clear. Act tough. The recent spurt in police shootings here is perceptible, only because ­gun-related crimes were mostly a blip in Bangalore. Police in UP have faced flak from rights groups over the death of nearly 70 alleged criminals in more than 1,000 encounters since the BJP government assumed power in 2017. Police firings, whether in riot control or crime, are a grey area. Discharging a police firearm is meant to be the last resort and, therefore, to be rarely used. It is controversial for sure, even to be thinking aloud about it. Ironically, the person who tripped up on that count a fortnight ago was Karnataka chief minister H.D. Kumaraswamy in an entirely unrelated context. The visuals playing on loop were of the CM uttering the words: “Shoot madi, thondhre illa (shoot them, no problem)” while speaking on the phone presumably to an official. Kumaraswamy quickly offered a clarification that it was his distressed reaction to the brazen murder of a partyman in Mandya, a town 100 km from Bangalore, not an order to shoot anybody. But by then, the news was all over. Human rights NGOs petitioned the Karnataka Human Rights Commission over the CM’s language. Kumaraswamy offered explanation again, said he meant smoke-out, instead of shoot-out. Coming back to Bangalore, every big city has a grisly underbelly and its crime stats—even accounting for some inevitable burking—tell only part of the story. The recent spurt in police shootings here is perceptible, only because gun-related incidents were mostly a blip in Bangalore. To be sure, it predates the Kumaraswamy government, which came to power seven months ago. In 2017, there were 22 instances of police shooting at offenders and the year before, only six. But is that changing now? Is crime control getting tougher, reflecting the general lament about the loopholes in the criminal justice system? Or, are the police, as the cliché goes, getting trigger-happy? Could it, perhaps, be one of many symptoms of the growth frenzy that Bangalore has witnessed in recent years? “We are not trigger-happy,” Banga­lore Police commissioner T. Suneel Kumar tells Outlook. “I can use a minimum force whenever there is resistance to arrest.” Of course, the challenge of policing a city of over 10 million on limited resources—Bangalore’s sanctioned strength of civil police is around 18,000, not counting the nearly 6,000 armed reserve—can’t be understated. Some shifts in crime patterns are apparent too. Especially in cybercrime: over 4,800 complaints were registered last year at the cybercrime police station ranging, from phishing incidents to bank frauds, an ‘alarming increase’, as one officer puts it, although not entirely unexpected. But street crime—for instance, that old menace of chain-snatching—is still the bane for any urban police force. Just two weeks ago, a news item that stood out in the papers was about a senior IPS officer having his mobile phone snatched away by two men on a motorcycle in one of Bangalore’s upmarket residential areas while he was out walking. 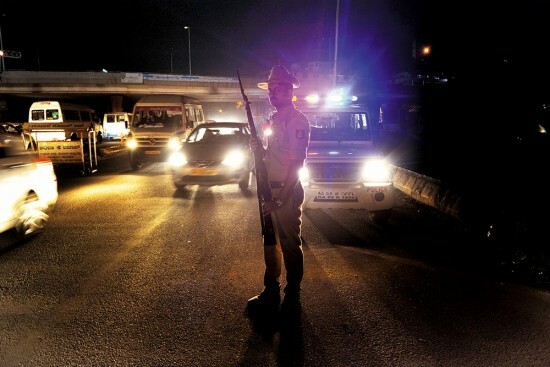 It’s not that Bangalore is getting ­unsafe or its crime incidence is rising. Take the New Year’s Eve celebrations last week, which passed off without incident unlike two years ago when the revelry gone out-of-hand touched off a contentious debate on the safety of women. This time, the police were out in full force, with a water cannon on standby on MG Road. In three hours around midnight, the city’s control room dispatched patrol vehicles to attend to 1,200 complaints—twice the volume than on any given day—mostly related to drunken brawls and misbehaviour. Besides, the traffic cops even rented out wedding halls across the city to detain drunk motorists until they sobered up. “When you have law enforcement, you can do a lot of things. But if it is weak, then you have a problem,” says Kiran Mazumdar-Shaw, one of the city’s most prominent residents. “Bangalore is the most affluent city in the country and because of that we do get rising criminal activity,” she says. “If you do a relative comparison to any city in India, I think Bangalore is very safe...young women feel much safer here than in any other city.” Besides, the police force clearly has brushed up its soft skills, particularly on social media. The Bangalore police Twitter handle, whose one-liners and memes have been an online hit for a while now, has a million and a quarter followers. The patrol response system too has been given a complete overhaul in the last couple of years. The Bangalore Police commissioner’s office in central Bangalore has the typical tech signature of the times. It’s around midday when Outlook meets Suneel Kumar and four large screens on the wall display a real-time picture of the day so far. The control room has received 2,462 calls in 12 hours, of which a little more than 150 required a police visit. The positions of the city’s 274 GPS-fitted patrol vehicles are mapped out—139 vehicles are busy, 112 available and 23 nearing their shift end. The police control room has 100 lines with 150 operators working in three shifts. The average answering time is 3.5 seconds while the conversations typically average 4 minutes following which the nearest patrol vehicle is alerted. “The average time of response, from police to the caller is eight-and-a-half minutes,” says Kumar. Every case is logged and text messages with details of the ­policeman deployed in response to the caller sent. The follow-ups are ­recorded. Mobility, clearly, appears to be the key in urban policing. In December alone, the police shot at seven men, injuring them in the leg: six were wanted in murder cases and one was a sandalwood thief. Rupak Kumar Dutta, a member of the Karnataka Human Rights Commission, says till now there were no complaints of violation of human rights and police excesses related to the firing incidents. As a former Karnataka police chief—Dutta retired in 2017—he agrees it’s a thin line policemen are treading whenever they use firearms. “The police cannot be trigger-happy, but they should always take action when the situation warrants it. You cannot be taking a beating and retreat.” The only way to look at these incidents, reckons S.T. Ramesh, another former police chief, is on a case-by-case basis. “Such things cannot be analysed on a statistical basis alone. What were the circumstances in which they opened fire? Was there really a case of right of private defence which the police had to resort to?” he says. It definitely indicates a change in the response of the police and there could be many reasons for that, he says. In December alone, the police shot at seven men, injuring them in the leg—six were wanted in murder cases and one was a sandalwood thief. It’s pretty much a similar story that runs through the 30-odd incidents. In a couple of instances, the offenders were from outside Karnataka and also wanted in other cities. “But, nowhere was any person killed,” says one officer. “At least, the message will be clear that the police means business.” Perhaps. But others don’t reckon so. “It gives a wrong signal,” says Mathews Philip of South India Cell for Human Rights Education and Monitoring. “The crime rate will not come down by doing this. You may be able to capture these so-called habitual offenders, but these kinds of things have no deterrent effect on crime,” adds Philip, citing the debate over capital punishment as an example. “We expect the police to act tough. It doesn’t have to go to the stage of firing,” he says. But some of that also loops back into the tired, old call for reforming the system. Even policemen admit this. Better investigation and evidence collection are key in stopping habitual offenders. Dec 9 Rajesh (in pic), wanted in dacoity cases, nabbed in Annapoorneshwari Nagar. This refers to your cover story Shoot Madi (Jan 12) about the aggressive ‘shoot at stumps’ strategy of the Bangalore police for crime control in the IT city. It’s not even close to being as bad as the chilling police encounter drive in Uttar Pradesh, where the cops have gone on a killing spree, but it is certainly a matter of concern. We cannot be supportive of such measures as they give the cops the licence to violence against citizens, even if they are criminals. There can, of course, be exceptional situations where the police have to take the gun into their hands for self-defence, but making shootings a regular policy is not the way. Do we know that in all the instances mentioned in your story, the criminals shot by the police were carrying weapons and threatening the cops with fire? No. Then it’s ­impossible to say that each one of these encounters were justified. Vigilante culture is already a menace that the country is dealing with. The cops can’t be allowed to spill their better judgement into that domain. Movie culture valourises the vigilante cop, making him palatable for the ­audiences. But our fantasies should remain in the realm of fiction.